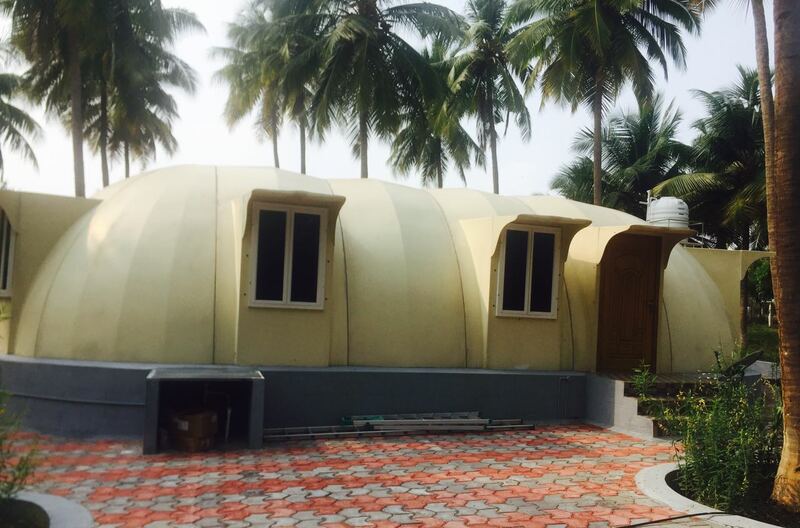 FRP Dome House building has enormous advantages over the conventional buildings and for your quick reference, we mention here some of the benefits – low maintenance; fast assembly; high impact resistance (over 8000 psi); no painting, no mildew, no rot, no rust, no corrosion, no termite attack, no shingles, energy efficient (zero energy as an option); high-density urethane foam for insulation, weatherproof; fire retardant and provide insulation value R-28 plus compared to R-3 for conventional buildings. Occasional washing can keep the dome house like new. Its aero-dynamic shape makes Dome buildings virtually wind-proof and gives high structural load capacity. The height and strength of the fiberglass shell greatly reduces the risk of structural damage or personal injury/loss in earthquake prone regions. The dome shape has 1/3rd less outside surface than a conventional building for an additional 30% energy saving, if it is Air-conditioned. Note:-After submiting Your Data will be passed to Business Owner and You will be notified soon. Above information is filled by the ORG/BUSINESS holder.